Spring-time rain storm, complete with a nice, rolling, thunder. It is on mornings such as these that you sleep a little longer, stay in your pajamas a little later, drink coffee all day, and eat breakfast whenever you want! I decided to make one of Studhubs favorites for brunch. whoever you serve it to will feel like a million bucks because it's not your everyday breakfast. It is sweet, rich, and gooey, all the things that make your tummy say "YUM!" You can use any kind of bread you like. I had this beautiful ciabatta so I decided to use it. When using artisan breads, make sure you slice the bread thinly. You want the egg mixture to be able to penetrate into the bread itself. Heat your skillet or griddle over medium/high heat, and spray with cooking spray. If you are using regular sandwich bread a quick flip will do. If you are using something like ciabatta, you will nee to give is a minute or two. and let cook for 2-3 minutes. Delicious Classic French Toast, perfect for rainy day brunches, breakfast for dinner, or any time of the week. 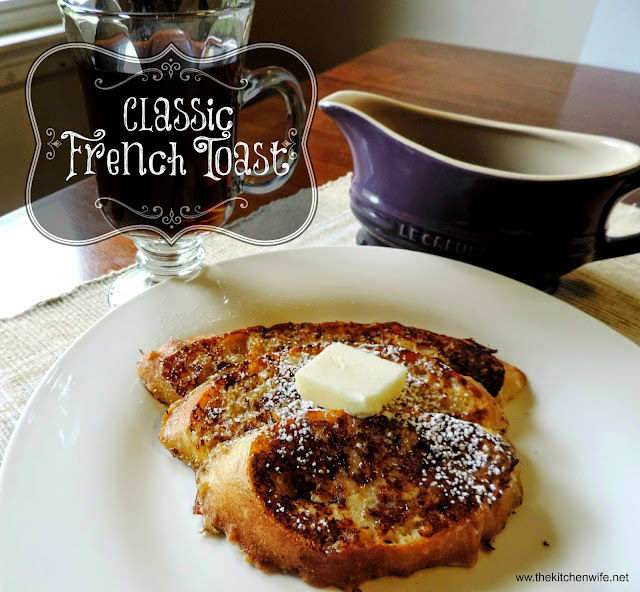 Serve it up with some delicious maple syrup, a pat of butter, and a dusting of confectioner's sugar...PERFECTION! I can't wait for you to try this dish, and I look forward to hearing all about it on my Facebook Page! In a baking dish combine the eggs, milk, sugar, cinnamon, and vanilla. Pre-heat skillet or griddle over medium/high heat. Dip bread into the egg mixture. Place on pre-heated skillet or griddle. Allow 2-3 minutes to cook. Serve with syrup, butter, confectioner's sugar, fruit, etc.